the clock tower bell will ring five past five. jane's corner view, francesca's hosting, elsa's theme. Hey Momma, I'm so sorry I have not been by lately, I have had my tool belt on lately working with Phil....and its so cold up here now.....working outside I'm layered to the hilt! 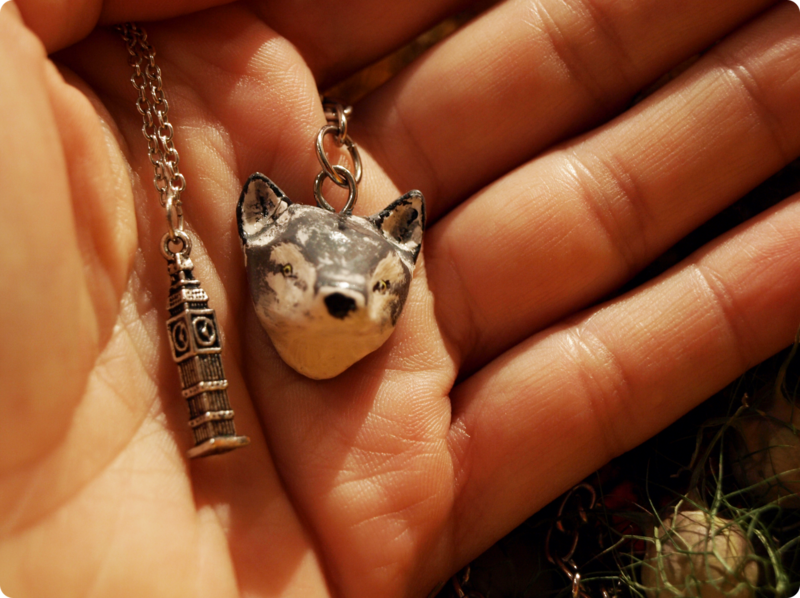 Love your charms......the wolf suits you.....hows your construction coming along? i musta been writing as you were? windows are finally arriving next week, i keep my hands clenched to my heart. we're sistas in arms again, ain't we? and it will be the perfect moment to have tea! I wish you a nice day, ma chère ! ps. nothing happens when i hover! doesn't the mouse tell you the creators? just text, no dynamic link! hope it will be soon! PS creators do display at my end. A little wolf for the wolf <3. I love the little wolf, such an adorable sly smile. that is really cool !! i like it. I'm now on the hunt for tiny wolf(s) for you, Kers! My Annabel's favorite animal. Adorable! i am jealous because of that tiny little wolf to hang around your neck!! your wolf hovering near that tower makes my imagination loom!! What could be a better goodluck charm than a woolf...and Big Ben remembers me that I miss good old London! My I invite you to this week's drawing challenge with the the "leaves"? I am the host: http://www.herzfrisch.com/blog/invitation/ and it wood be a pleasure for me. Love that little wolf! and also love your driftwood inspired drawing in the previous post! i LIKE the tiny tinny wolf and the little ben alongside. i like even more your last two pictures. i really, really do. i am so happy to see you at the art farm this mornin! i was afraid i had lost all my readers in my long absence! i had a peek at Acorn Antiques, timeless campy humor very funny indeed! Carol Burnett and friends had a show in the 70's here...reminded me of it. do you know it? your origami patterned ghost story has my eyes searching and looking...looking for that ghost, that surprise...in a window, behind a door. perfect!